Those of us that live in an older mobile home or even a new manufactured home have already made a huge step in green living even though you may not realize it. It’s not that difficult to be a little more earth friendly when updating a mobile home. I gathered a few green tips for remodeling your mobile home to help you out. 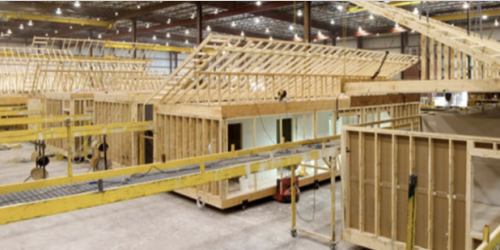 The construction process of manufactured homes in factories are green even if the company doesn’t mean to be (thankfully most do). By mass producing the homes there is a reduction in waste. Greenhouse gases are lower because the supplies are purchased and transported in large quantities. The equipment and tools used are in a roofed facility with regular maintenance which means a longer life span. A manufactured home is very earth friendly because it’s built in a factory. The material handling equipment in most factories are powered by propane or compressed natural gas, leading to a reduction of emissions compared to gas or diesel. The cutting and assembly of the materials is optimized to save every inch. Practically the entire process is environmentally friendly! Older Mobile Homes are Green, too! If you live in an older mobile home, you’ve also done the environment a huge favor! You have kept waste out of landfills and the environmentalist will tell you that updating an older home is the absolute best way to be green, it beats out any new construction by a long shot. You’ve reused by buying a used home and you’re repairing when you remodel and update the home, making it last years longer than its natural life span. There are plenty of easy things you can do to continue the green movement. If you’re looking to remodel soon these green tips for remodeling your mobile home will help mother earth and your budget. 1. Use non-volatile paint. It’s just smarter! 2. Use coal fly ash in concrete. 4. Use blue jeans as insulation. Yep, denim makes a wonderful insulator. 5. Use recycled glass and tile flooring containing up to 100 percent recycled materials. 6. Use carpets containing recycled nylon. 7. Use drywall containing at least 96 percent recycled materials. 8. Use ceiling fans, they work. 9. Recycle your old carpet. 10. Buy second hand. There’s lots of salvage re-sellers now. For plumbing replacement, Polyvinyl chloride (PVC) is recyclable. In fact, PVC is the second most commonly used plastic after polyethylene, but it isn’t commonly accepted in curbside programs. Learn more about mobile home plumbing here. Linoleum is recyclable, and compostable and biodegradable if it’s natural. Many building supply companies and certain charity organizations will accept old linoleum for recycling. Learn about luxury vinyl tile flooring here. Bricks are recyclable and can often be sold to local masonry companies for resale as aged brick or ground up to make concrete. If it is free of contaminants like lead paint or asbestos, gypsum drywall is recyclable. Many building supply companies will accept it for recycling. VOG, or vinyl on gypsum walls, are the most popular walls used in older mobile and manufactured homes. 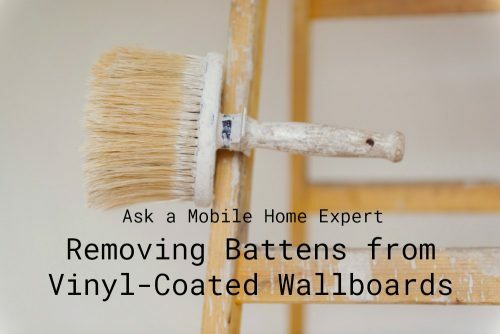 Many homeowners end up replacing the VOG panels with sheetrock but you can reduce waste and cost by following the green tips for remodeling your mobile home vinyl walls. Vog panels have a glossy coating and strips, also called battens, that cover the seams where each panels meets. This walls can be updated but you’ll need to know a few important tips. You can read the Manufactured Housing Gypsum Construction Guide here. To paint VOG panels you will need to wash the walls down. This is the single most important step so don’t skimp – use a quality cleaning agent and go over the walls twice. Primer and paint has to bond to the walls and it cannot do that if there it’s not well cleaned. These green tips for remodeling your mobile home are helpful to the environment and to your wallet. Do you have any green tips? Share them in the comments below! As always, thank you so much for reading Mobile Home Living!